The IBMA Foundation makes it possible for individuals and organizations to support the future of bluegrass music through charitable donations and planned giving. We are so grateful for the support of our patrons. Click here to see the list of our generous donors. Annual Bluegrass Foundation grants- (up to $2000 each) are designed to assist programs that align with the goals of the Foundation. The deadline to apply: December 1. To download the appropriate forms for these two types of grants, click on the "Grant" tab at the top of our Home Page. Are you in a touring or local band who is interested in sharing bluegrass with young people? Foundation for Bluegrass Music offers half-day training located in various regions of thew U.S., usually affiliated with major festivals or bluegrass association meetings—where artists will already be in attendance. Event producers and association leaders interested in helping to develop bluegrass programs for local students are also welcome at these workshops. A live demonstration of a bluegrass program for students, from an experienced band, with a Q & A session. Info on current Foundation for Bluegrass Music tools available, including the Discover Bluegrass DVD & lesson plans, Mini-Grant application info, regional teacher workshops, the online Bluegrass in the Schools Implementation Manual and more. A “tip sheet” for artists that includes ideas on how to develop and present educational bluegrass programs for students, based on a survey of 20 bands who are currently doing a good job at this already. 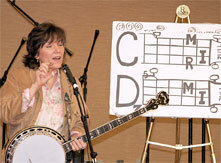 Information on how to pitch Bluegrass in the Schools programs to local schools, and also ideas about how to fund them.